If you’ve been paying attention to literacy activism for the past couple of years, then you’re probably already quite familiar with the notion of the Little Free Library. The idea there is that you post the little free library on your property, fill it with books, and others can take or leave materials as they wish. It’s a great way to build literacy and a community around books. 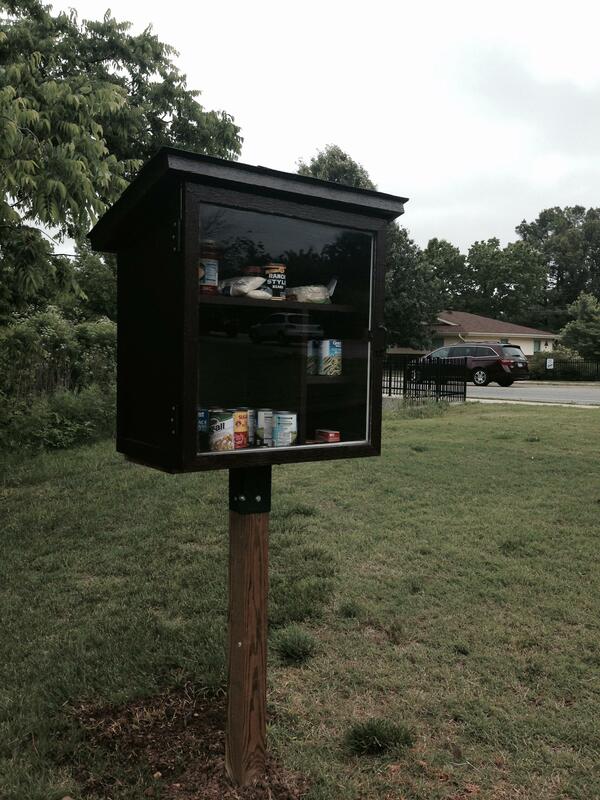 The Little Free Pantry takes inspiration from this, and instead focuses on food stability. Individuals build a box and then stock it with pantry items that others may need – cereal, toilet paper, toothpaste, flour, canned goods, etc. So far, there are three Little Free Pantry locations: two in Fayetteville, AR and one in Ardmore, OK. The great thing about the Little Free Pantry (LFP) model is that it really focuses on neighbors helping neighbors. If implemented in high poverty areas, it can serve as the saving grace for a family who would otherwise go hungry. The LFP can also serve for those who need to borrow a cup of sugar or for kids who might need an after-school snack. The point is for it to be used freely – people put into the LFP and they take out from the LFP. The LFP provides a service that regular food pantries can’t provide – access to food 24 hours a day. It’s a small pantry, so it really is meant to be a “you need it now” type solution. It’s a great way to help address problems of food insecurity and to help those in need who may have fallen through the cracks or who may not otherwise qualify for assistance. The website for the LFP has many tips on how to start an LFP in your own area, how to build an LFP, and how to stock an LFP to best serve the community. Things such as previously used clothing, sharp objects, and chemicals are better left out of the LFP. You’re also going to want to make sure that stocking food is allowed in your area as some districts forbid feeding the homeless. Whatever you do, this is a noble project. Even if you are not able to build one yourself, advocating for a church group or other organization to put together an LFP program in your neighborhood can really help out those who are living with food insecurity. What will you do to promote the LFP project? Comment below and be sure to share this post widely.